Often you need to collect additional data in order to successfully identify the bug in your application. You write ("log") additional useful information (events) into a single file ("log"), which is then attached to bug report. It is called "logging" (the act of keeping a log). 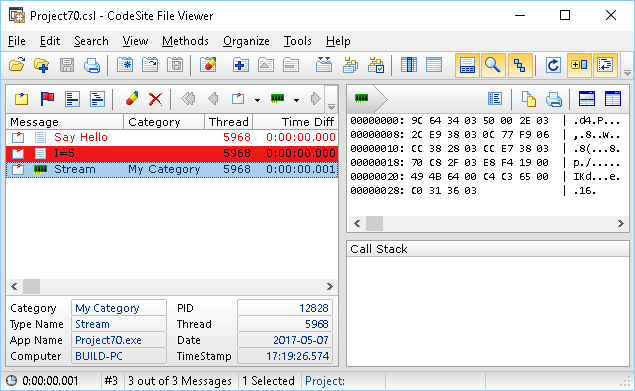 • Routines in EMemLeaks unit can be used to mark (name) objects and other memory blocks. This is useful for memory leaks and other memory problems (name can help to identify object or otherwise anonymous memory block). • Routines in ELogging unit can be used to log any data into a single log file. This is useful to get idea of overall flow of your application. EurekaLog is capable to extract some information about variables (for example, content of the string, dimensions of dynamic array, class name of objects, names of components). Therefore, it is not necessary to specify all tiny details. BTW, you can change name again at any time. This makes Stream a child of fmDialog. This means that Stream will not appear in reports. Instead - its size will be added to fmDialog. This code will remove parent-child relationship. 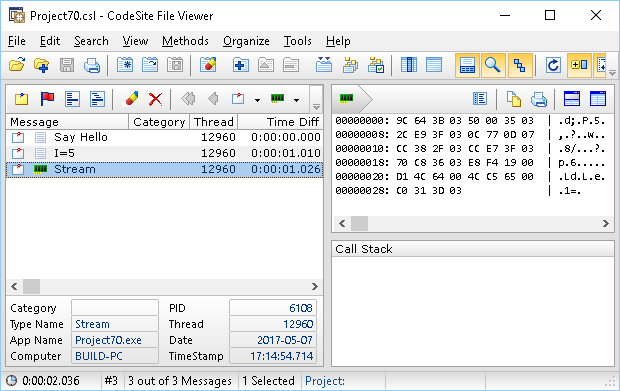 ELogging unit writes log into CodeSite-compatible format (.csl file format). CodeSite format is mostly textual. 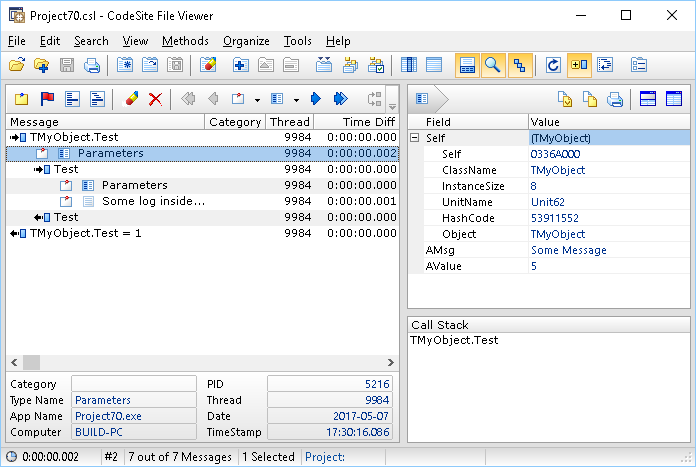 You can view it in advanced text editors (such as Notepad++) or use free CodeSite File Viewer tool. You can obtain it either via installing CodeSite (it is available via GetIt in latest RAD Studio IDEs) or download standalone installer. Note: EurekaLog is not a replacement for CodeSite (or any other logging framework). EurekaLog has no log dispatcher, no live logging, no TCP/HTTP logging, no complex logging methods, etc. EurekaLog simply writes local report file. Only simple logging methods are available. 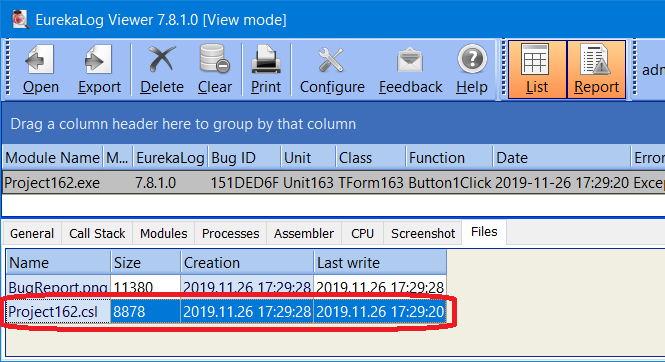 This code will create new log file in the APPDATA folder (with the same name as .exe file). You can create log file in any location. We recommend to use .csl file extension. Creating log file should be the first action by your code, before you call any other routines in ELogging unit. If you do not call ELogOpen function - logging will be performed into temporal file, which will be deleted when application exists. Always call ELogOpen function to get permanently saved log. Do not call ELogOpen function if you only want log file as attach to bug report (see below). See ELogging unit for more information on possible constructs. This code will log entering and exiting from the function, as well as indents log to the right, so any nested calls to ELog inside Test function will be written indented to the right. Please note, that you have to always call either D or C methods as the last action in chain - to indicate that function has no more arguments. Otherwise (if you forgot to close function call) indentation for nested log entries will be wrong. The difference between D and C is that D creates a normal (expanded) log entry, and C creates closed (collapsed) entry.